Today’s business environment has increased in the complexity and rate of change that a database administrator must control. The ability to respond quickly to a changing environment is constantly challenged by the explosion of data growth combined with a decline in an experienced work staff. The IBM® DB2® Administration Tool for z/OS® Version 10 helps you become productive from Day 1 with DB2 10 for z/OS by using performance savings right away, lowering the CPU costs while reducing the batch window. Users experience higher data availability by easily managing online schema changes, including additional columns to indexes to use index-only access. Access new functionality in DB2 10 for z/OS to lower costs and improve efficiency both before, during, and after the DB2 migration process. Maximize the performance of your key DB2 business applications to speed their deployment in DB2 10 for z/OS. Improve the productivity and efficiency of your staff when DB2 10 for z/OS is running. 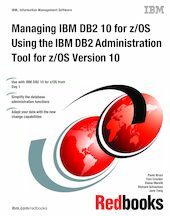 This IBM Redbooks® publication highlights the data administration enhancements introduced by DB2 Administration Tool for z/OS Version 10 by providing scenarios of their use with the new functions provided by DB2 10 for z/OS.